Semifreddo, sabayon and sorbet could be linguistic tongue twisters, answers to culinary trivia or, most appropriately, three versatile desserts that in the heat of the summer are often overshadowed by ice creams and s’mores. Somewhat intimidating to consider they incorporate some of the simplest ingredients and employ clearly recognizable techniques to produce plates of sophistication and simplicity. While they will never be sought after, they are often a pleasant surprise, especially when prepared or served with seasonal ingredients to highlight their freshness. Semifreddo is loosely translated as “half frozen” for its mousse like texture and partly for the method of preparation. It is a simple custard typically highly flavored that is folded into whipped cream and frozen. The whipped cream prevents the custard from freezing solid resulting in a dessert that at once is very rich but also has the lightness of a mousse. The custard is the flavor element, ranging from very light to intense dark flavors like espresso and bitter caramel. You can count on the whipped cream to temper most elements and provide a buffer for even the heat of a chilie. Berry semifeddo tends to run more to the dark berries like blackberry or raspberry. Stone fruits like peaches and tree fruits like apples may require some roasting or caramelizing to draw more flavor to the custard. The custard is cooked somewhat on the stove and includes the flavoring agent, eggs and or egg yolks and sugar and in some cases some cornstarch to help with thickening the custard base. Once the custard is thickened on the stove it is cooled and whipped cream is folded in to make it lighter. It’s then frozen and served as a base for other flavors or on its own. Sabayon is the French equivalent of the Italian zabaglione and is also a form of custard. It draws its versatility from the base flavors and the method of preparation. Often served as a “sauce” for fresh berries it is a light frothy mix of egg yolks, sugar and usually a light wine or spirit such as champagne or Marsala. Eaten as an accompaniment to fruit or with a light cake it provides a burst of flavor and richness that pairs well with the sweetness of berries. Sabayon also can be caramelized by a torch similar in method to toasting a marshmallow giving the finished dessert a nice brown crust. 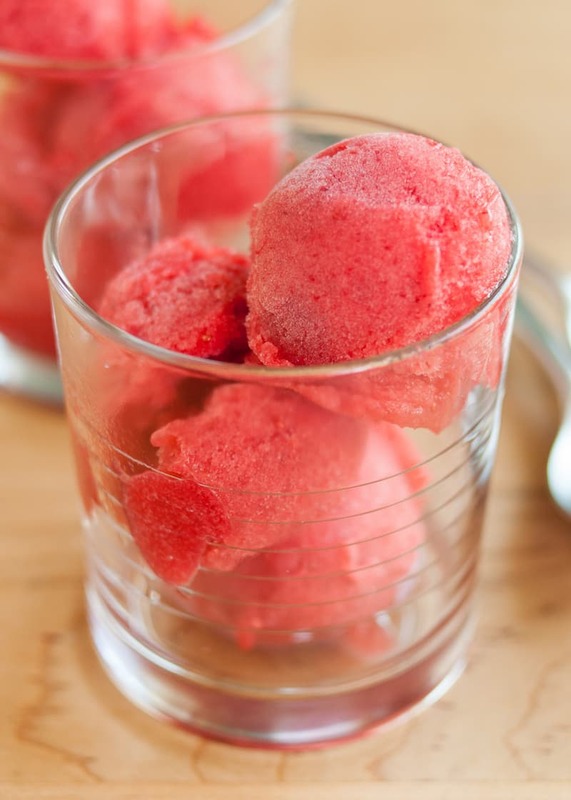 Sorbet is probably the best known of these three desserts. Usually fruit based it can be as simple as a granite or shaved ice or as complex as the silky smooth renditions that you find in five star restaurants. The best sorbets mimic the fruit they are made of, making no attempt to mask the fruit’s flavor with anything else. Granitas, are the basic form of sorbet, done without the aid of an ice cream maker. They rely on a freezer and time to continually break up the ice crystals so that they can form again until the bond they form is smoother. Simply puree or juice the fruit, add sugar to sweeten and then place in your freezer. Periodically scrap the granite with a fork to break it up and place it back in the freezer. Do this every half hour and within several hours you will have a granita to spoon into a cup and enjoy on a hot day. What sets sorbet apart from an ice or granite is the ice cream machine itself. Ice cream in general could be frozen as a crème anglaise or base custard but what gives ice cream, gelato and sorbet their added richness and luxury is the addition of air through the churning of the ice cream base. Sorbet takes on a lighter, smoother texture because we add air in the churning process. Strawberry ice becomes sorbet as we go from low tech to high tech. What distinguishes all these desserts from the better known treats is the relative simplicity of the ingredients and method. Cream, sugar and a whisk, fruit juice, simple syrup and time. With the exception of the sorbet the equipment needs are minimal and the enjoyment factor can come in the process especially if some younger cooks want to be involved. The custard is the key here as you need to make sure you get the proper flavor and consistency before you fold in the whipped cream. The custard- usually 4 egg yolks to a quart of cream, ¾ cup of sugar, the addition of a flavoring agent, and two tbl. of cornstarch are a solid base for the custard. The difference can come if your flavoring agent is a puree, adding liquid to the mix may require another egg or less cream. The whipped cream- 1 cup of cream. Powdered sugar optional. Heat the flavoring agent with the cream, (example 1 tbl. of vanilla) to infuse flavor. Whisk the egg yolks with the sugar until very pale yellow and thick and then add in the cornstarch to combine. Temper the egg yolk mixture with the warm cream until you can whisk the entire cream mixture through the egg mixture. Place the custard back on a water bath or over low heat and stir until it is thick, but not pasty. When cool it should be spreadable but not pourable. Whisk the cup of heavy cream in a bowl to stiff peaks and fold it into the cool but not cold custard, do not stir or beat it in. If you feel the custard is not sweet enough add some powdered sugar to the cup of heavy cream before you whisk it. Make sure the combined custard mix is very flavorful before freezing as cold takes away some of the flavor of the semifreddo. Chill or freeze as needed and if frozen let it warm a little before serving it as the flavor and texture will be fuller. This procedure requires you to whisk for an extended amount of time over a hot water bath. It can be accomplished with a stand mixer with the bowl attachment sitting in another bowl of warm water or warming the mixing bowl periodically before whisking again. If you can though it is better to whisk by hand so that you can better gauge the changes in texture. The wine can be substituted out for a liqueur or a fortified wine like sherry or Marsala. Whisk all the ingredients in a clean stainless steel bowl over a warm water bath until it’s thick and frothy to the point that ribbons left by your whisk do not immediately disappear into the sabayon. Make a simple syrup, it’s easier to use than trying to dissolve sugar into a puree or cooking out of the base. You want to puree your fruit and strain to get the smoothest texture possible. Berries will need no extra water to form the base other fruits with less water may need up to a pint of water for 2 pints of puree and 2 pints of simple syrup. Always taste the base before churning to determine whether more simple syrup or maybe some acid is needed. Heat them together until the sugar dissolves. Can be stored covered for several weeks. Basic sorbet recipe-To 2 lbs. of strained fruit puree add the same amount of simple syrup. Chill overnight and churn. 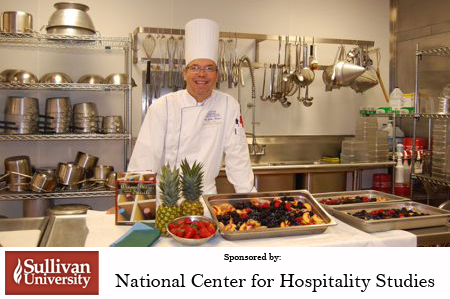 John Foster is an executive chef who heads the culinary program at Sullivan University’s Lexington campus. A New York native, Foster has been active in the Lexington culinary scene and a promoter of local and seasonal foods for more than 20 years. The French Culinary Institute-trained chef has been the executive chef of his former restaurant, Harvest, and now his Chevy Chase eatery, The Sage Rabbit, in Lexington.